National speaker: Jim Aydelotte, "The Lease Option Coach"
* It requires little or no money to get started. * That’s huge for many people, because if you were like me – I lived paycheck-to-paycheck. * I did not have the funds needed to invest in properties.It allows you to take control of a property without taking title to it. It is the only strategy that I know of that can put several thousand dollars into your bank account in as little as 30 days! FREE BONUS CD - For first 50 >>> ''Finding and Speaking With Motivated Sellers"
Open forum discussion on real estate investing in the unique Jersey Shore market. All Day Workshop - Putting LEASE OPTIONS to Work for You! Multiple wholesaling topics covered -- great opportunity to get the tools needed to create a successful wholesaling business / side hustle. New Jersey Tax Certificate Auctions!! Once you’ve found the deal, what do you do with it??? Join us for the Acquisitions & Exit Strategies Subgroup to find out. Q&A Panel for Landlords -- ask any question about being a landlord! SJREIA Membership Has its Benefits! Network with the right people you need/want to know to help grow your investing business. Discounts at: Office Max, 2% Home Depot rebate, and many more -- SCROLL DOWN for more info. Members: Refer a non-member to join and you earn 25 SJREIA bucks to apply toward renewal or seminars. SJREIA has a unique agreement code you need to enter when you set up your account. Home Depot has put together an amazing Paint and Appliance Program for the Members of National REIA! The new National Paint Program for all National REIA Members is very simple. You will receive 20% off Interior and Exterior Paints and Primers including all of the Home Depot quality paints - Behr, Kilz, Glidden & Zinsser! Ask questions, get answers, share ideas, read and learn! To join - Go to "CONTACT US" link at top of this page (upper right). Include your first and last name. you want, exactly when you want it. 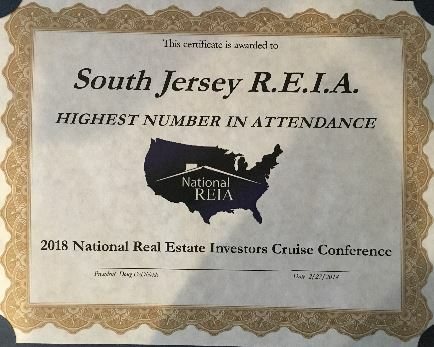 For over 30 years, South Jersey Real Estate Investors (SJREIA) has been an educational and networking association specifically designed for the real estate investor and landlord. Our goal is to help our members find success and build wealth through real estate endeavors. The mission statement of SJREIA is to help the real estate entrepreneur in gaining practical knowledge of real estate investments through education, discussion and networking. The Board of Directors and officers of SJREIA are elected by the general membership and are volunteers. 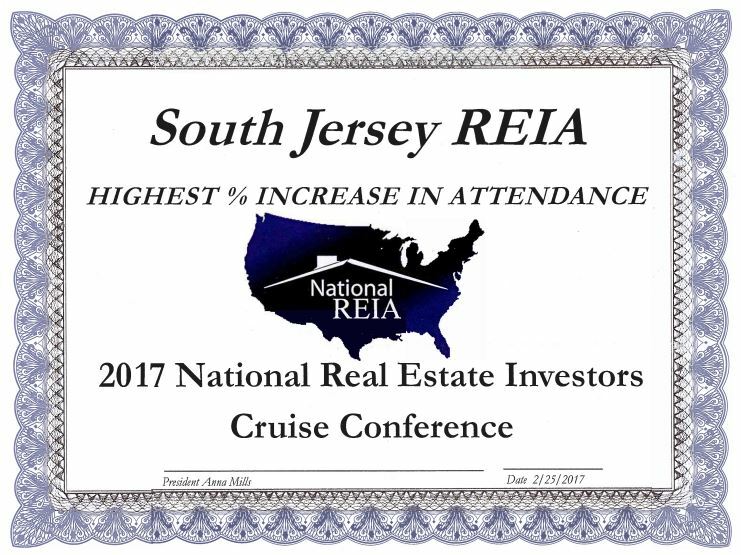 Our organization is affiliated with the National Real Estate Investor's Association (National REIA). 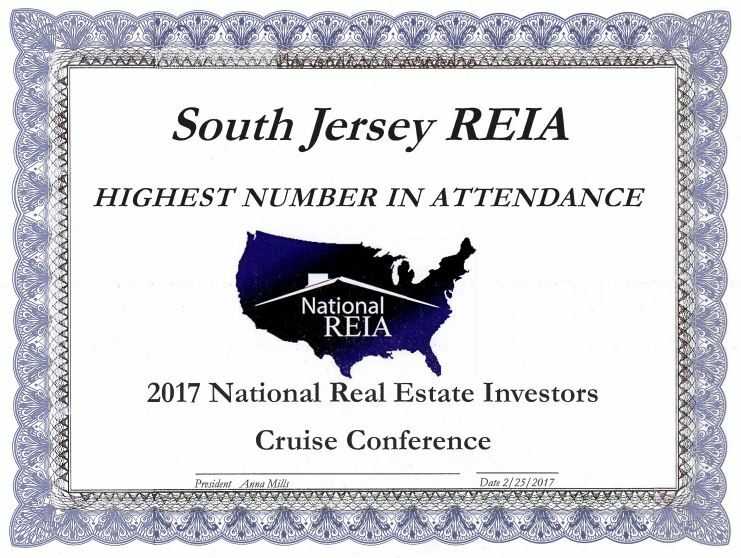 SJREIA is a premier real estate investment association and strives to bring in only the very best national and local speakers to provide the latest cutting-edge techniques based on any changes in law or the marketplace. If you are looking to belong to an organization that can help you with buying and selling of properties, then come to our meetings to see if we are a good fit for your investing needs. DISCLAIMER: The information and news presented in SJREIA publications and at group meetings should not be construed as legal advice, which should be obtained through a qualified real estate attorney only. 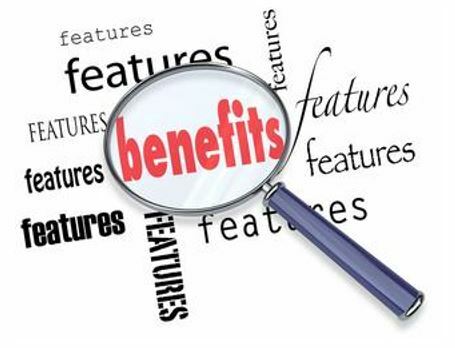 SJREIA does not exist to render and does not give legal, tax, economic, investment or financial advice and disclaims all liability for the actions or inaction taken or not as a result of communications from or to its members, officers, directors and employees. Each individual should consult his/her own counsel, accountant and other advisors as to legal, tax, economic, investment, financial and related matters concerning real estate and other investments. 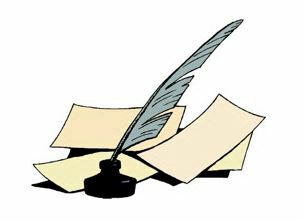 The opinions expressed by the members are not those of SJREIA. SJREIA does not endorse any person or organization. Its programs are designed to be educational, motivational and enjoyable. Remember, speakers primarily discuss techniques and methods that work for them but may not be appropriate for you. Whenever actions involving purchases, sales, or tenant relations are being considered, rely upon the advice of your real estate professionals. MOTIVATED to SELL! Make an offer. HOT DEAL WHOLESALE ASKING $105,900/ ARV $185K ! Congratulations to Shawn M. for selling the property.